“You wake and hear the birds cough,” according to a BBC documentary on Jamshedpur. Pollution? We never considered it. For us, it was the city of parks and gardens: the Locomotive Park in the neighbouring company town, TELCO, (named after The Tata Electric Locomotive Company), with the locomotive, we’d “drive,” saying Locomotive, locomotive, put on steam; the airplane in Aeroplane Park we “flew;” the Clock Park, with a clock made of flowers, whose massive moving flower-planted hands accurately told time. And, above all, magical Jubilee Park, JubliPark, often pronounced as one word, created to celebrate Tata Iron and Steel’s fiftieth anniversary. We wandered through its mazy rose gardens, inhaling the ecstatic fragrance of whimsically bred elegant roses, violet, blue, even black. 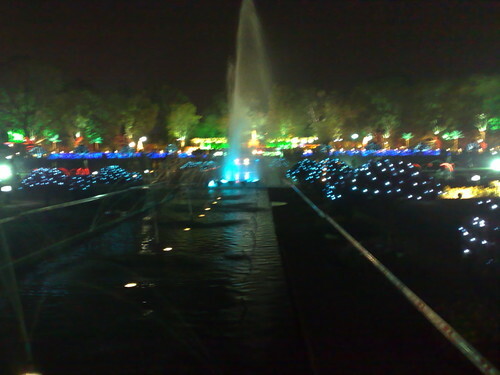 After dark, the fountains were floodlit by chameleon lights, continually changing their peacock display: ruby, sapphire, sunflower, then mixing, emerald, violet, orange, and, finally, as the eye wearied, white again. Bridges arched over streams; I stared down until I felt dizzy. “Perhaps you suffer from vertigo,” my father said. Vertigo, vertiginious. New treasured words. From little wheeled carts, we bought peanuts, which we sometimes called groundnuts or monkey nuts, heated over coals with salt and chilli powder. As I chafed off their red wispy coats, I read the handmade paper bags, made of old magazines or scrap paper. Like everyone, we sold our old exercise books and scrap paper to the vendors who came door to door, and I hoped to read secret love letters, or our friends’ household accounts on my peanuts bag; or that someone would say, “I read your school essay on my peanuts bag. It was brilliant.” Fame, at last! And then the blessed second wind came. He imparted basic training, survival skills. “Take my wife,” he grinned. My father allowed me to take the carved dagger, the kukri, he had bought on his honeymoon in Kashmir to protect us. As shadows loomed, I ran towards them, whooping war-cries, my kukri carving circles in the air. The shadows turned out to be rejas, female manual labourers, balancing wicker baskets on their heads, in which they carted away the still hot discarded slag from the works of the Tata Iron and Steel Company, sifting it for refinable bits of iron ore. “Bacchao, Sahib, Bachao,” they yelled, good-naturedly. “Save us, Sir. Save us.” Everyone laughed. In their baskets were a few mushrooms. At dawn after rainy nights, my mother went to the market to snap up these wild long-stalked mushrooms, the earth’s secret gifts, which the forest-dwelling Adivasis, the tribal people who had not yet been assimilated into India’s mainstream culture–junglis, they were called–had gathered at the first brightening of day, trudging with them into the city to squat in the market, spreading their precious pickings on an old saree. We fried these with butter, onion, garlic, coriander and mint, still a favourite meal, serving them on hot buttered toast. We competed to buy them with the tribal rejas, who, homesick and self-exiled from their dense green forests, a grief compounded by their hot, monotonous work at the steel factory, bought a few of these expensive mushrooms, knotting them in the corners of their sarees to cook with onions for their dinner. On an island, in the center of the lake, clever impracticality, was a restaurant, over-priced, so a treat. Row, row, row your hired boat there. And there: golden brown masala dosas, South Indian delicacies, restaurant food, two foot long crisp rice pancakes, protruding far beyond the stainless steel plate, oozing with mustard-seeded, oniony, tumeric-bright potatoes, served with little stainless steel bowls of coconut chutney, and sambhar, black-mustard-seed -flecked lentil sauce. It’s perverse not to eat dosas with one’s fingers: a multi-phasic ritual. Crack the crisp crust at the centre; pour the sambhar into the opening over the potatoes; spoon in some coconut chutney, then tear corners of the dosa and use them to scoop up fingerfuls of mashy potato; hot, spicy sambhar sauce; and cool leaf-green coconut chutney, a magical mouthful of flavours. I had my own ritual in the restaurant. I seized the pepper shakers and sniffed and sneezed, sniffed and sneezed, chanting like Lewis Carroll’s mad duchess, “Speak roughly to your little boy/ And beat him when he sneezes/ He only does it to annoy/ Because he knows it teases.” “Stop it,” my mother eventually said. But I only did it to annoy, because I knew it teases. Occasionally, when my parents craved South Indian food, we drove miles to the town’s only South Indian restaurant in Sakchi, dark, crowded and scruffy, my father, looking around, frowning and furtive. He was Controller of Accounts at Tata Iron and Steel, Senior Management, and, Jamshedpur being stratified and class-conscious, did not want to be spotted at so down-market an establishment by the clientele: manual labourers, clerks and secretaries from South India, who also worked at TISCO. However, the dosas, so delicious and near-impossible to mimic at home, compensated for his embarrassment as being seen among the throngs of voluble working-class South Indian families out on a Saturday morning treat; bachelor workers who ate all their meals there; or the man of the family, splurging his earnings on himself. My parents nostalgically ordered the tastes of their South Indian childhood, which have now become the tastes of my North Indian childhood: idlis, ovals of ground steamed rice, that compensated for their own blandness by being doused with spicy sambhar, and coconut chutney. Other exercises in nostalgia: upma, semolina, fried with nuts, split peas, and vegetables; uttapam, a spicy rice flour pancake; and vadas, lentil donuts, tastes which pale when described in English. The waiter brought scalding, very sweet coffee to our table which he cooled by pouring the brown fragrant steaming river from one outstretched hand to a steel “tumbler” three feet below, tumbler to tumbler until it was drinkable. Coffee by the yard, my father said, soto voce. Coffee is the drink of the South with its coffee plantations while North Indians, with their tea plantations, drink tea, chai, for breakfast, and at tea; and grab little clay cups of tea from dhabas, shacks, or roadside carts with their always-bubbling brass cauldrons of sweet milky tea, doctored periodically with more milk, sugar or tea leaves. But the restaurant of my heart was Franks, the oddly named and only Chinese restaurant in town, run, equally oddly, by Chinese Catholics. It was green-walled, green-lit by little dim hurricane lamps on tables with, like promises of better things, cruets of soya sauce and red chilli sauce in which seeds still swam. But I knew what I wanted, and I wanted nothing but it: “Franks’ Special Chow Mein” and “Franks’ Special Fried Rice.” When perfection comes, the imperfect fades away. They were Chinese food for me, and I had to have both. “You always order the same thing,” my mother said, “We need a main dish to go with it.” She ordered spring rolls; sweet and sour pork; and too sweet, too crisp chop suey which I refused to touch. Things should be either sweet or sour. Laodicean in-betweenness was heretical! And with a flourish: steaming platters of wriggly noodles, glistening with flecks of oil and soya sauce, rainbow-flecked with… Our forks explored: pork, beef, prawn, chicken, mushrooms, peppers which my parents eccentrically called capsicum and black membranes of mushrooms like jellyfish, slippery unctuous pleasure. And there was fried rice, with the colours of a pastel spring: green onions, green peas, carrots, pink shrimp, red bacon. We flecked the whiteness with soya sauce. I ate rapidly, silently, ecstatically. Everyone, including my mother, liked shrimp best, and so she offered hers around, on fork tip and we accepted, greed conquering guilt. And then, I could eat no more. And always, the same wonder: I entered the car satiated, fell asleep, and realised as our car pulled into our driveway that I was hungry again. How could it be?